What a fun weekend! The West 18th Street Fashion Show was Saturday in Kansas City. I attended with one of my best girlfriends (who was kind enough to snap the picture above), and we were both thoroughly impressed by the show! On Sunday, my brother, sister-in-law, boyfriend and I had a little True Blood premiere party complete with delicious Bloody Marys. How was your weekend? Oh your outfit is spectacular! You know how to find the best pieces. I love the orange and contrasting black & white. I love the print with that pop of orange! This is probably one of my favorite outfits! Love how you matched the lips to the outfit! ahhh! you look amazing. i love everything about this outfit. also, thanks for updating so often! i look forward to your blog daily. This is awesome! I just love that bright skirt! Yes, I love this outfit very much so. I LOVE this outfit. You can rock those shoes with any outfit. I've been looking for a similar pair but keep chickening out. The 18th St. FAshion Show is always incredible. Your outfit is great! A True Blood season premiere party is an excellent idea! I was so excited it was finally here again. You look so spectacular. I love the way your skirt matches your lipstick. The outfit is just perfection. i love your makeup. you look so dolled up. pretty little outfit. perfect for the hot weather. You always look amazing. Those shoes are frickin' awesome and I really love the print of the top. I love Ks City! and I really like this skirt, great look! I went to the show too. It was my first time, and was a lot of fun. VaVaVoom. You look great, lady. You look so classy and amazing! 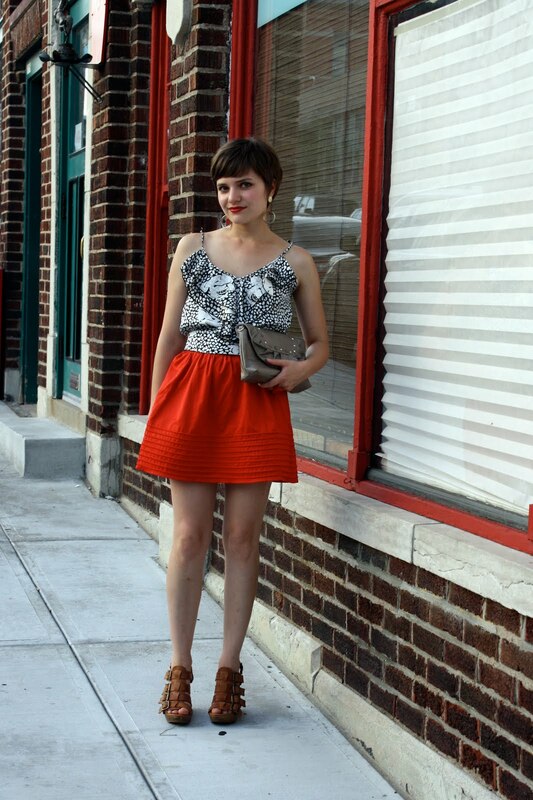 love your red skirt and, above all, your purse! You look fab! we saw you from a distance at the show! i desperately wanted to beam myself up and over the runway/crowd, so that i could take your photo, but the mobs of people were way too crazy. maybe next time! Those shoes are amazing!! I added you in my blogroll!! Definitely one of my favorite bloggers. this is such a chic look! i especially love your hair! LOVE that top! Looks awesome with the skirt! Great style!! I love that ruffly top!! It goes wonderfully with that skirt, and I am loving your red lipstick. (I'm a big fan of True Blood too, by the way). Great colors and love the pattern! Love this outfit. They colors are great together. Can't believe the top & skirt were only $20! Spectacular! :) I love that red skirt. :) And the shoes, and everything! LOL! Katy, I am a producer of the West 18th Street Fashion Show - thanks so much for mentioning us in your blog. We are glad you enjoyed the show! you look so pretty!!! the skirt is so cute! !love it!!! this is so great, the different textures going on makes it.